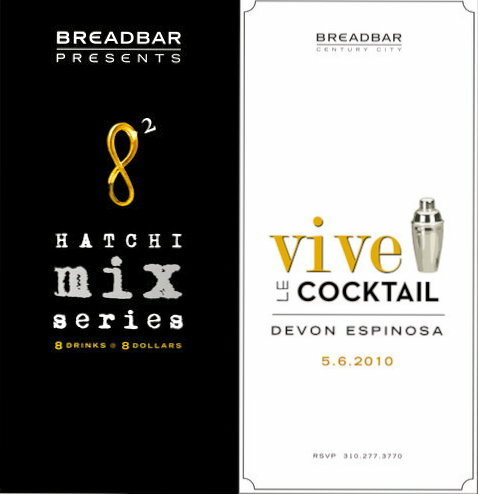 This Thursday, May 6, Breadbar presents the debut of Hatchi Mix, a guest mixologist series hosted by Chef Noriyuki Sugie at Breadbar’s Century City location. Inspired by the popular Hatchi Guest Chef Series, Hatchi Mix will allow imbibers to experience the evolution of the cocktail, from the classic era to its present-day state, through a special one-night-only menu. Taking a cue from its name (hatchi is the number “8” in Japanese), each unique Hatchi Mix menu will feature eight cocktails, priced at $8 each. The Sazerac – believed to be the first cocktail invented in America, with its origins dating back to pre-Civil War New Orleans. The Martinez – developed by legendary turn-of-the-century bartender Jerry Thomas in San Francisco’s Occidental Hotel sometime in the late 1800s. The Last Word – originated at the Detroit Athletic Club and lost for decades until its recent resurrection by Seattle bartender Murray Stenson (Zig Zag Café). In addition to launching the series, Espinosa will invite future Hatchi Mix guests to highlight the modern cocktail’s different aspects and mixology techniques, as well as showcase the thriving Los Angeles cocktail culture. Upcoming mixologists include Joel Black (Caña), featuring his rum cocktail menu on June 3, and the aforementioned Julian Cox, whose cocktails will spotlight tequila on July 1.